On Thursday, July 13, participants enjoyed "Crush's Homers for Hearts," a once-in-a-lifetime opportunity to compete in a Home Run Derby challenge in foursomes on the field at Oriole Park. Along with taking part in the Home Run Derby, participants also had the opportunity to watch a private Orioles team workout prior to the event, warm up on the field with Orioles strength and conditioning coaches, enjoy complimentary food and beverages, and take pictures with Chris and Jill Davis. Additionally, the Davis family hosted patients from UMCH for a longest ball T-ball challenge. 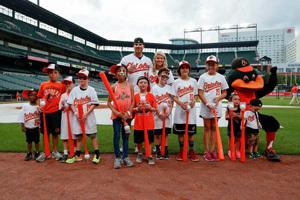 To read the full news story from the Orioles and watch a special event recap video, click here.